Jackrabbit databases can be set to track absences or track attendance (days attended). The Student Attendance Report is available regardless of what your database is set to track and allows you to see important attendance metrics quickly and easily! See how often students attended or missed class to promote students, assess instructor effectiveness, and review the current session schedule for class popularity. View attendance details showing which students were late for class, left class early, or were only observing the class that day. Identify any patterns and address the situation by sending an email directly from the report results. The Student Attendance Report is located in the Families / Students section (Students tab) and the Classes / Enrollment section (Attendance tab) of the Reports menu. The Student Attendance Report can be generated for a single date, or a range of dates. The Attendance Filter criteria is a great way to search for students with a specific number or percentage of absences or attendance. Identify students who qualify for a Perfect Attendance Award by setting the Attendance Filter to either # Absences, is equal to, 0 or % Attended, is equal to, 100. If you have multiple locations in your database, use the Family Location criteria to drill down to only those students in Family records with a specific location or the Class Location criteria to look at only students enrolled in classes at a specific location. You can also use search fields to select a specific Class, Family/Acct, or Student. There are three display settings that affect your report output. Select this check box to see which students were marked Late, Left Early, or Observing when attendance was taken in the Staff Portal. Show one row per student per class - each class the student is enrolled in shows on a separate row with the attendance details for that specific class. Show one row per student - shows 'the big picture' for each student and combines the attendance details for all classes they are enrolled in into one row in the report. Use class start and end dates - The Class Start and End Dates are used to figure out what days the student could have attended. This is how most people will run this report. 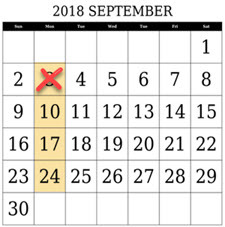 Ignore class start and end dates - The Class Start and End Dates are ignored, only the overall days the student attended this same class are considered. This is useful if you have perpetual classes where you change the Class Start Dates frequently. There are many columns of information available in the report results. Customize your report with the Show/Hide Columns button; select only the information important to you. Select Apply to have these selections applied to only the report you are currently viewing. Select Apply & Save to have these selections applied and saved for your User ID. When logged in as your User ID, you will see only the columns of information you chose previously. Other Users will see the columns they selected and saved, which may differ from yours. The report is sorted by family name as the default, but you can click on the column header of any column to re-sort the results based on that column. The report in the above image was sorted by student in increasing, alphabetical order. Email directly from the report results! Use the Email button to create an email to the families in the report results. 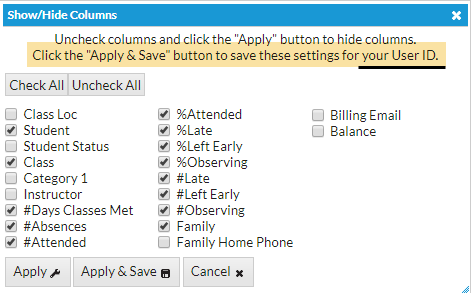 Select the Email All check box to include all families or select only some families using their check box. A record of this email is kept in the Family record on the Misc tab > View Sent Emails for 180 days. You would like to find all students with perfect attendance for the previous month in order to hand out Perfect Attendance awards. The display setting for Show Attendance Issues was selected. The students included in the report all had perfect attendance, however, the Show Attendance Issues lets you know that students Chris Martin and Lauren Andrews were late for 50% and 75% of their classes. This may disqualify them from the award depending on your tolerance. This is the number of times the class met during the time frame used when you created the report. This number may differ between students because it takes into account a student's enroll date and drop date. If you have added any Closed Dates, these are also factored in. - A student who was enrolled on 9/1/18 would have 3 in the # Days Classes Met column. - A student who was enrolled on 9/15/18 would have 2 in the # Days Classes Met column. - A student who was enrolled on 9/1/18 but dropped on 9/20/18 would have 2 in the # Days Classes Met column. The # Days Classes Met is also affected by the report Display Option setting How do you want to count the number of days the classes met (see above). When you are taking attendance in the Staff Portal, this is the number of of times the student was marked absent (during the time frame used for the report). If your database is set to track absences, and you are not using the Staff Portal for attendance, this is the number of times an absence was recorded for the student in the Class record (during the time frame used for the report). If your database is set to track attendance, and you are not using the Staff Portal for attendance, the # Absences column will show zeros. When you are taking attendance in the Staff Portal, this is the number of times the student was marked present (during the time frame used for the report). If your database is set to track attendance, and you are not using the Staff Portal for attendance, this is the number of times an attendance was recorded for the student in the Class record (during the time frame used for the report). If your database is set to track absences, and you are not using the Staff Portal for attendance, the # Attended column will show zeros. When taking attendance in the Staff Portal, the total # Absences and # Attended should add to the total # Days Classes Met. If this isn't the case, it is an indication that there is incomplete attendance. Use the Incomplete Portal Attendance Report to find the classes that need attention. 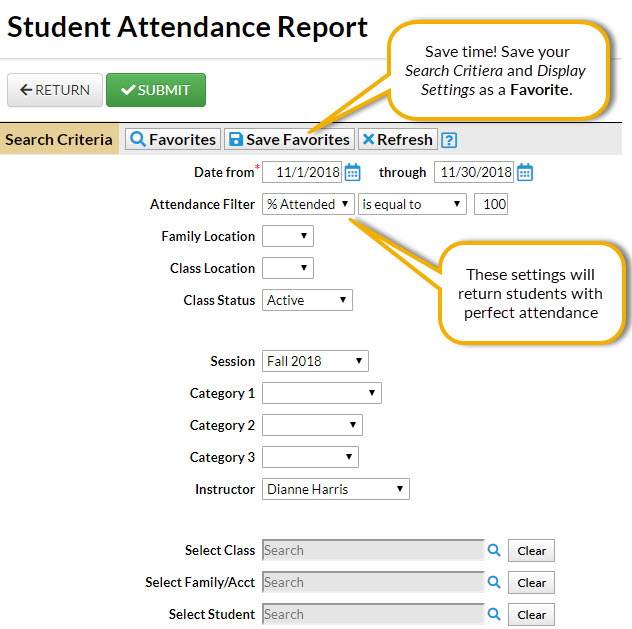 In addition to being accessible from the Reports menu, the Student Attendance Report can also generated from the Student and Class records using the Absence/Attendance button. When generated from the Student record, the search field for Select Student is automatically filled with the student name in the search criteria. When generated from the Class record, the search field for Select Class is automatically filled with the class name in the search criteria.